Since the European invasion of Australia in 1788, the Aboriginal people have been oppressed into a world unnatural to their existence for thousands of years. First came the influx of the strangers who carried with them diseases, which decimated the immediate population of the Sydney tribes. It is estimated that over 750,000 Aboriginal people inhabited the island continent in 1788. The colonists were led to believe that the land was terra nullius (‘no one’s land’), which Lt James Cook declared Australia to be in 1770 during his voyage around the coast of Australia. 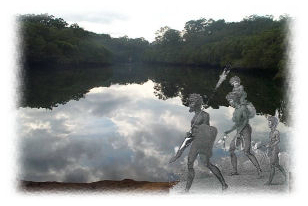 For thousands of years prior to the arrival of Europeans, northern Sydney was occupied by different Aboriginal clans. Living primarily along the foreshores of the harbour, they fished and hunted in the waters and hinterlands of the area, and harvested food from the surrounding bush. Self-sufficient and harmonious, they had no need to travel far from their lands, since the resources about them were so abundant, and trade with other tribal groups was well established. Moving throughout their country in accordance with the seasons, people only needed to spend about 4-5 hours per day working to ensure their survival. With such a large amount of leisure time available, they developed a rich and complex ritual life – language, customs, spirituality and the law – the heart of which was connection to the land. The arrival of Lt James Cook in 1770 marked the beginning of the end for this ancient way of life. Cook’s voyage of exploration had sailed under instructions to take possession of the Southern Continent if it was uninhabited, or with the consent of the natives if it was occupied. Either way, it was to be taken. Upon his arrival, Lt Cook declared the land he called New South Wales to be the property of Britain’s King George III, and ignored the inconvenient fact that the land was already well populated. His failure to even attempt to gain the consent of the natives began the legal fiction that Australia was waste and unoccupied (terra nullius: learn more). Cook was followed soon enough by the arrival of the First Fleet, in January of 1788, under the command of Captain Arthur Phillip, whose mission was to establish a penal colony and take control of Terra Australia for settlement. The first act of land ownership by Europeans came within four days of arrival when a group of men from the HMS Sirius went ashore to clear land to gain access to fresh water. By 26 January, the First Fleet had found its way to Sydney Cove and landed there on the harbour. The early Europeans took a dim view of the Aboriginal way of life when first they encountered it. For Aboriginal people and, in this instance, the clans living on the northern shores of Sydney, nothing could have been further from the truth. What the early colonists never understood, and perhaps what many Australians are only now beginning to grasp, was that the Aboriginal lifestyle was based on total kinship with the natural environment. Wisdom and skills obtained over the millennia enabled them to use their environment to the maximum. For the Aboriginal people, acts such as killing animals for food or building a shelter were steeped in ritual and spirituality, and carried out in perfect balance with their surroundings. Food was abundant, as was fresh water and shelter. Everything needed for a fruitful, healthy life was readily available. It was not to remain so. 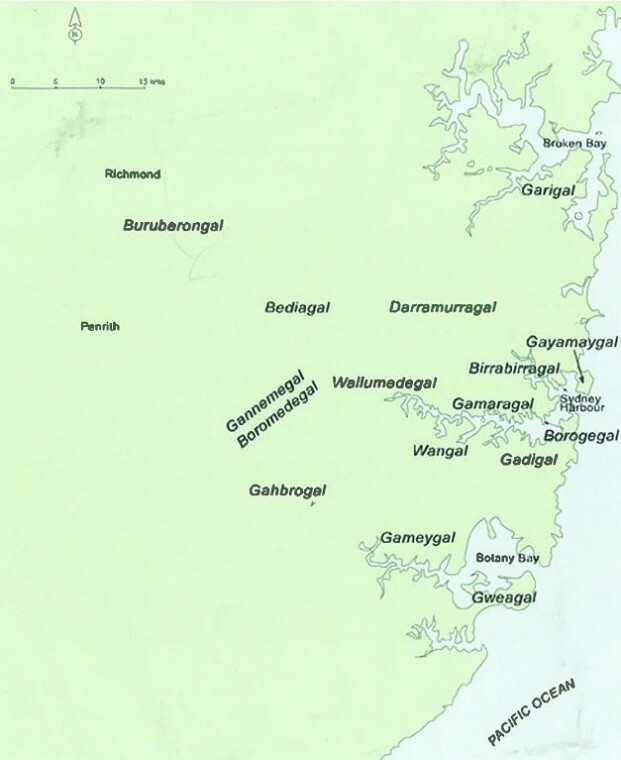 The British arrival brought armed conflict and a lack of understanding, which heralded the demise of the northern Sydney clans, along with the other peoples of the Sydney basin – the Dharawal to the south and the Dharug to the west. Food shortages soon became a problem. The large white population depleted the fish by netting huge catches, reduced the kangaroo population with unsustainable hunting, cleared the land, and polluted the water. As a result, the Aboriginal people throughout the Sydney Basin were soon close to starvation. Disease struck a fatal and extensive blow to the Aboriginal people, who until that point had been isolated for thousands of years from the diseases that had raged through Europe and Asia. They had no resistance to the deadly viruses carried by the sailors and convicts such as smallpox, syphilis and influenza. In less than a year, over half the indigenous population living in the Sydney Basin had died from smallpox. The region, once alive with a vibrant mix of Aboriginal clans, now fell silent. The colonists had destroyed within six months a way of life that had outlasted British history by tens of thousands of years, and the people soon realised that the trespassers were committed to nothing less than total occupation of the land. To most settlers, the Aboriginal people were considered akin to kangaroos, dingoes and emus, strange fauna to be eradicated to make way for the development of farming and grazing. And though a guerrilla war had been mounted against the British during the early years of the colony (learn more), the eradication, for the most part, had been easy. Smallpox had destroyed over half the population and those not ravaged by disease were displaced when land was cleared for settlements and farms. Dispossessed of the land that had nourished them for so long, the Aboriginal people became dependent on white food and clothing. Alcohol, used as a means of trade by the British, served to further shatter traditional social and family structures. European civilisation devastated, in what amounts to the blink of an eye, an incomparable and ancient people. Because the vast majority of clans living in the Sydney Basin were killed as a result of the 1788 invasion, the stories of the land have been lost forever. Much of what we do know about the northern Sydney clans must be gleaned from their archaeological remains. Middens, shelters, engravings and art remnants of indigenous life are prolific throughout the region, but no one remains to reveal their particular meanings or ancient significance. No one remains to bring the archaeology truly alive. Aboriginal history has been handed down in ways of stories, dances, myths and legends. The dreaming is history. A history of how the world, which was featureless, was transformed into mountains, hills, valleys and waterways. The dreaming tells about how the stars were formed and how the sun came to be. In the metropolitan area of Sydney there are thousands of Aboriginal sites, over 1000 just in the AHO partner Council areas. These sites are under threat every day from development, vandalism and natural erosion. The sites cannot be replaced and once they are destroyed, they are gone forever. The sites that are located in Lane Cove, North Sydney, Willoughby, Ku-ring-gai, Strathfield and Northern Beaches Council areas are still in reasonable condition and hold an important part in our history. The Aboriginal people, who once occupied this area, left important evidence of their past and way of life before colonisation. 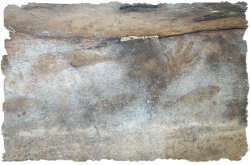 All Aboriginal sites are significant to Aboriginal people because they are evidence of the past Aboriginal occupation of Australia and are valued as a link with their traditional culture. An emphasis is placed on the scientific investigation into stone technology for a great deal of insight is obtained by studying the manufacture techniques and animals associated with them that tells us about daily traditional life. Clues to what these sites were used for can also be surmised by talking with Elders from other parts of Australia where traditional knowledge has not been lost to the same degree. 1. quotation from interview in 2007, printed in Currie J (2008) Bo-ra-ne Ya-goo-na Par-ry-boo-go Yesterday Today Tomorrow: An Aboriginal History of Willoughby Willoughby City Council.